In these parts we fish freestone streams, not given to massive hatches although blessed with some very good trout and near constant clear water. Sight fishing entertains us for much of the season and he fish are picky in terms of presentation if not particularly fussed with specific dietary requirements. Generally the trout are pretty much average, somewhere between 12” and 14” smaller in some parts of the river system it has to be said and then again one manages to locate the odd fish over the magic 20”mark once or twice a season. It all adds a bit of spice to the mix, and the strict no stocking and catch and release regulations mean that the fishing is technically demanding, infuriatingly so at times. Not famous rivers on the world stage and not massive trout compared to some locations but I still tend to think world class, at least at it’s best. Yesterday I took Garth Wellman fishing, an old colleague from South African team competative days and given that he is a more than accomplished angler I could gamble a little on the venue, a place given at times to rather blustery conditions and tricky but generally larger fish. Garth chasing after another fired up rainbow seeking escape amongst the boulders. The water is still reasonably high from the winter rains, not high enough to cause any problems in terms of fishing, perhaps even assisting one’s presentation to a point. Mind you, definitely strong enough to give help to fish endeavouring to escape, as was going to be demonstrated to us rather pointedly in the course of the day. The first ten to twenty minutes on the water was spent as usual, fiddling with the leader, trying to obtain the all-important presentation that is critical to success on these streams. The fish may generally be pretty catholic of taste but they dislike dragging flies with a passion and any hint of movement of a dry fly due to the loss of slack in the tippet will be treated with the utmost distain. I suspect more anglers on these streams get refusals through poor presentation than wrong fly choice, it is a game of “Presentation, Presentation, Presentation”, so the leader is a critical element in the equation. With the leader functioning well and good drifts achieved Garth tackled the first rising fish we came upon. Nice steady sipping rises, a good sized fish, very good sized really and a bit of an exciting trout to target first up. The trout ignored the first couple of presentations so we added a soft hackle to the mix and he ate it but was missed on the take. Then we tried a tiny nymph and again the fish was missed; Garth doesn’t do much trout fishing these days and the first thing to go without constant practise is the timing of the strike. Sadly I have been similarly afflicted more than once in my life. Never mind there were two fish rising steadily in the next run, one larger and mostly head and tailing in the foam line, the other regularly making violent slashing rises, not typical at all on this stream. Both fish ignored a selection of fly patterns, including the soft hackle which had proven effective previously. So I was down at water level trying to figure out what was going on and we had a genuine compound hatch of bugs floating by. Net winged midges in the film along with some tiny olive spinners, some tan micro-caddis and their slightly larger black brethren and some tiny black mayfly duns as well. A real “mixed grill” of possible food items and it really seemed as though the fish were focused on one of them because we didn’t crack the code. After multiple casts and drifts of different patterns the fish went down. Too many casts, successful or otherwise will often produce that result but it was early and we didn’t imagine that messing up the first couple of opportunities would seriously spoil the day. The next run and no fish moving but one came up from the depths and took a tiny nymph, hung a couple of feet behind the dry fly. We have been doing a lot of this “dry and dropper” fishing of late, the trout seem to be more than usually preoccupied with food stuck in the film or even below it and haven’t responded that well to genuine floating patterns. In trouble again as a strong fish bores downstream using the current to full advantage. 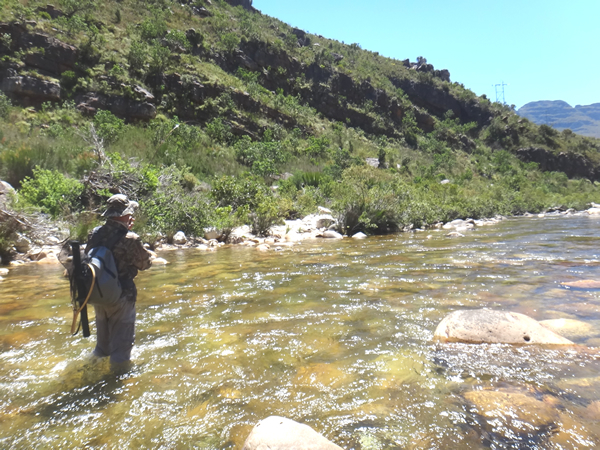 Anyway the line was sizzling out and the first fish of the day was boring upstream looking for a rock to dive under when “ping”, the line went slack and Garth revealed that the fly line had hooked around a water bottle on his belt. A very nice fish had made its escape as a result of the error and we were to rue that for the next half an hour when we didn’t see another fish. It seemed to have gone dead and nothing happened until we reached a section of wide pocket water. The sort of water that many anglers will walk past but experience had taught me that this was somewhere where one should be at pains to cover every little potential lie. The pockets aren’t as shallow as they look and frequently hold very good fish in amongst the boulders. Sure enough another really good fish hooked and it shot off downstream reel screaming as though one was “into” a tarpon. If fact the fish jumped like a tarpon, a veritable jumping jack of a fish, cartwheeling all over the place and using the flow to aid its escape bid. An escape bid that proved successful moments later when it jammed the tippet around a couple of the numerous rocks and the game was over. Darn it, another really really good fish gone by the wayside. A smiles as a fish finally hits the net. A similar result occurred with virtually every fish hooked, line around rocks, line around the reel seat, or the hook simply pulled out. Over and over again and not simply a function of poor angling, these fish were on fire. I haven’t seen so many really good strong and fit fish in the stream in a long while. 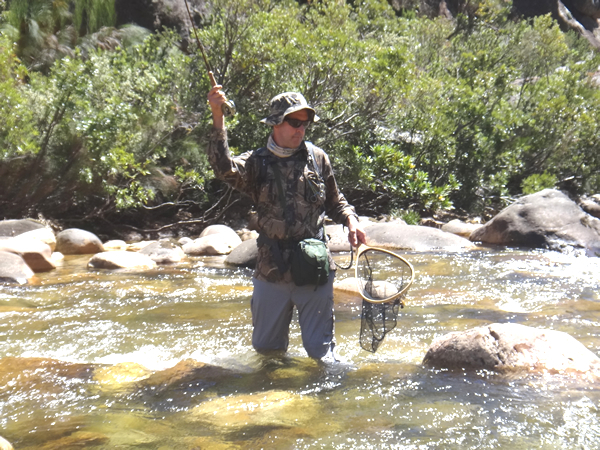 Most of the time, on these streams, the game is pretty much over once you set the hook, but on this occasion the fun was only starting with the take and we chased down stream, over boulders and through deep sections of the river in pursuit more than once without actually righteously wetting the net. By day’s end Garth did land a few and my only couple of casts for the day saw me hook up and get similarly “smoked” when the line caught around the rod handle moments into the fight. Last week, when guiding two other clients on much the same piece of water we had similar experience, there were some big fish on the feed, not easy to temp and a whole lot more tricky to land if you managed to set the hook. The river is on fire right now, maybe the angling skills are still a bit rusty, and to be sure more than a few clients have been taken by surprise, but it just seems that the fish are really in very very fine fettle and anything over 14” is just tearing up the stream, jumping and cavorting; snapped tippets, even without intervention of rod handles, reels or water bottles is probably going to prove to be less than unusual. Sadly in the week since the lower sections of our streams to which this post refers have seen rapidly warming temperatures, equally rapidly falling flow rates and pollution from one of the two operations upstream. A trout farm and a series of “decorative ponds”, once of which seems to be dumping considerable amounts of sediment into the river. It is a sad sight compared to little more than a week back when the stream bed was unsullied and the water crystal clear and cool. There is still fishing and still some good fish but it isn’t what it was. I don’t recall such a rapid change in the early parts of the season before. It isn’t likely but we might get some rain and sharpen things up, and perhaps those responsible up river will stop whatever it is that they are doing to mess things up with their filth. One has to hope so; last week really was exceptionally good, now it is all looking a little grubby. 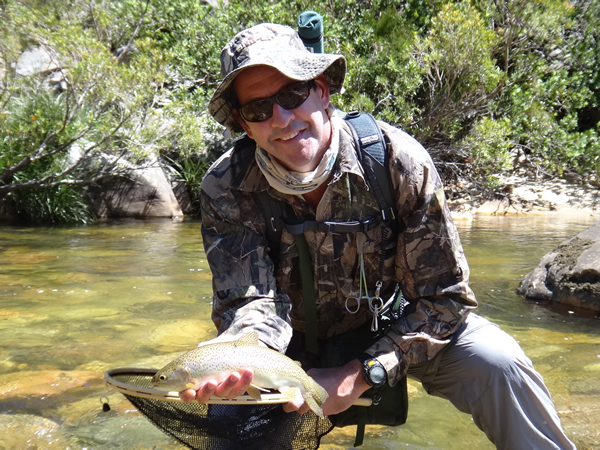 Click button to go to the Inkwazi Flyfishing Bookshop.